President Dieter F. Uchtdorf (b. November 6, 1940) served as a Seventy from 1994-2004, when he was called as a member of the Quorum of Twelve. He has served as second counselor in the First Presidency since 2008. "We human beings have a strange tendency to complicate simple things. We set up rules, laws, bylaws, processes, and subprocesses. Eventually, we pile up load after load until we end up under a huge weight of expectations that are so complicated it is difficult to keep track of them, let alone meet them. "This is one of the reasons Paul said, 'The letter killeth, but the spirit giveth life' (2 Corinthians 3:6). "Too often, we complicate the beauty and simplicity of the gospel of Jesus Christ with endless lists of meticulous expectations. However, when we focus on the 'why' of the gospel, much of the confusion fades away. Why are we here? Why are we asked to obey the commandments? Why is the Atonement of Jesus Christ of such value to us? "The proper 'why' questions will lead us to the proper 'who,' 'what,' 'when,' 'where,' and 'how' decisions." President Uchtdorf has spoken on several occasions about the importance and blessing of simplifying our approach to life or to the Gospel; for example, here and here. 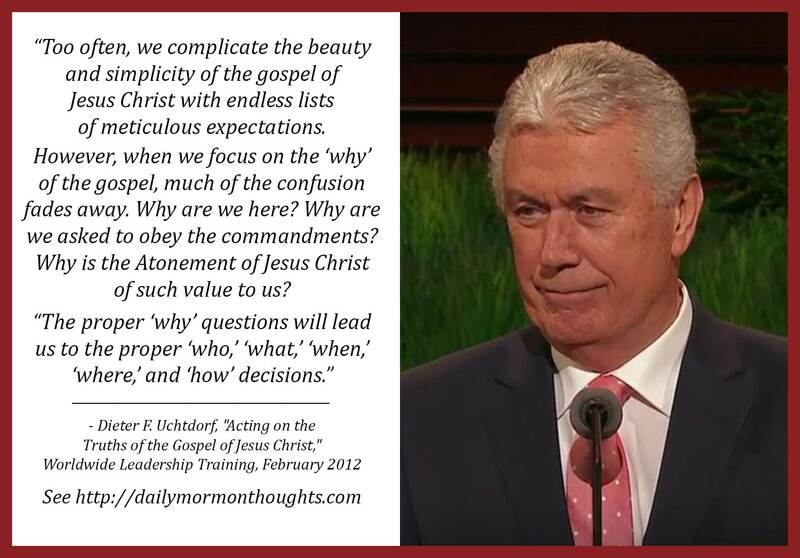 In this excerpt, he warns not only about the ways we complicate our lives at times, but also how we can make "the beauty and simplicity of the gospel of Jesus Christ" unnecessarily complicated. The key to avoiding this trap is to carefully consider the purposes and motivations of our beliefs and expectations—the "why" questions that lead to greater understanding. Asking the right questions leads to the right actions and decisions. That is because the right questions create a foundation of understanding on which appropriate actions can be built. I love this reminder, and will be asking myself more appropriately-probing "why" questions about my own life! 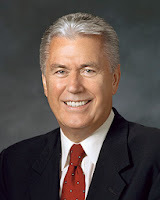 Labels: Atonement, Gospel, motivation, purpose, simplicity, Uchtdorf Dieter F.
The Church of Jesus Christ of Latter-day Saints is led by the First Presidency (a president and two counselors) and the Quorum of Twelve Apostles. Members of the Church (sometimes called "Mormons") sustain all 15 of these men as "prophets, seers, and revelators" and look to their teachings for guidance and support. This blog will share a daily quotation from one of the present or former Church leaders, along with a short reflection on the application of the thought. to be notified each morning of new messages. This is not an official page of The Church of Jesus Christ of Latter-day Saints. I love to hike, read, eat ice cream, cook, take photos, play with grandchildren, and write... all in the same day, if possible.